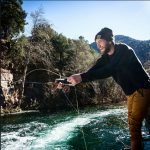 If you moved here from the Eastern United States and look at a river or creek such as the Verde River or Oak Creek you might think they are small – they are. You may think they are insignificant – they are not. That they are flowing at all in our arid environment makes even the smallest stream or spring a significant natural resource. 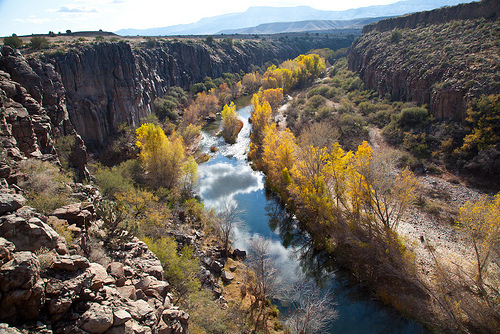 The Verde River, its tributaries and the springs that are the surface waters of our region are one of the most unique and important surface water systems in the Southwestern United States. Our region’s surface water and groundwater have been the subject of countless research studies for at least the last hundred years. 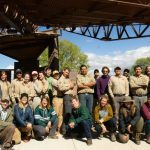 They have also been the topic of disputes over ownership of water rights, environmental issues, wildlife needs, impacts to our forests and the hydrology and geology of our groundwater aquifers. The fact is our surface water and groundwater are interconnected. This interconnection means that one can and does impact the other either in water quantity or quality. One of the most obvious examples of the connection between surface water and groundwater is the system of springs that supply water to our rivers and creeks. As the population of our region has increased, especially over the last 50 years, major springs throughout our region and state have dried up. The culprit for this is usually increased groundwater pumping. When an aquifer is in a stable state the amount of water being recharged into it is equal to the amount being discharged through springs. As pumping occurs more water is being taken out of an aquifer than being recharged. Springs are eventually affected. Arizona water law does not recognize the connection between surface water and groundwater. This is a major reason why many of our state’s streams and creeks have been pumped dry. While groundwater pumping can dry up springs it can also draw streamflow into the underlying groundwater system there by impacting the amount of surface water available. By some estimates Arizona has lost over eighty percent of its riparian areas. Creditable hydrologists and geologists acknowledge the interconnection between our surface water and groundwater. Arizona’s water law, as it relates to the connection of surface water and groundwater, is out of date. As long as this statute is in place we will continue to see our surface waters affected. Over the last couple of decades our region has struggled to find water resource management solutions that will help preserve our surface water and groundwater. 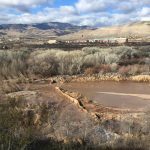 Twelve years ago, the Yavapai County Board of Supervisors formed the Water Advisory Committee (WAC) due to conflicts between different governmental jurisdictions within the county over water resource issues. The expectation was that the WAC would resolve the conflicts while developing cooperative and collaborative water resource management solutions. To date this has not occurred. Over time the WAC did work to initiate scientific water research that has helped to further refine the obvious, which is as we continue to grow we will require more water than we currently have and our water resources will be negatively affected. It is now time for our region’s leaders to come together to protect our surface water and groundwater. In April 2011 the United States Geological Survey (USGS) released its Northern Arizona Regional Groundwater-Flow Model (Model). A model is a computerized simulation of a groundwater system which is used to predict future impacts to the system. These models are used throughout Arizona and the United States to manage water resources. The USGS has said that numerical groundwater models are the most powerful tools for understanding streamflow depletion from groundwater pumping. The WAC has approved funding for use of the Model but due to internal issues within the WAC the Model still has not been used. We now have a management tool available to start and identify how decisions today will impact our water resources tomorrow. We will also be able to manage our water resources in a way that protects our quality of life, economy and environment. The first use of the Model to predict future impacts to our water resources is now underway and due to be released in late March or early April 2013. This use of the Model is a collaborative effort of the USGS and Verde River Basin Partnership funded by the Walton Family Foundation. 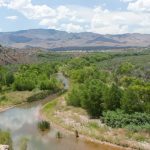 The Model simulation will help identify impacts to the Verde River over the next 100 years within the Verde Valley. Now is the time to manage our water resources by maximizing their potential while preserving our surface water and groundwater. This calls for our decision makers to work together in a cooperative process. Above all it requires that our water resource managers put to use the best science and tools available on which to base their decisions. The Northern Arizona Regional Groundwater-Flow Model is the best tool we have; similar models have proven reliable throughout the world.